A traditional winter flowering favourite, hellebores produce large clusters of saucer-shaped, nodding flowers. These hybrid hellebores are very variable and flowers may be plain or attractively patterned with spots and come in are range of colours including white, pink, green, mauve or smoky purple. When buying Helleborus x hybridus out of flowering season, it will be “pot luck” – when in flower, you may choose your favourite colour. 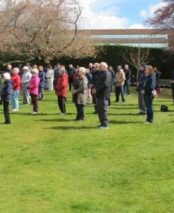 The large leathery-looking, evergreen foliage persists throughout the year but should be cut back around Christmas time just as the new flower stems and foliage are beginning to emerge. This helps to prevent the spread of fungal diseases, which can kill the precious plants if allowed to build up form one year to the next. 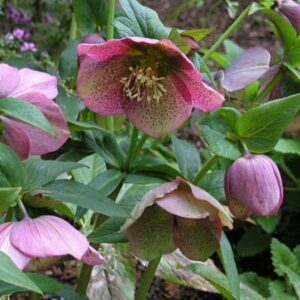 Helleborus x hybridus will tolerate all but very poorly drained or dry soils, but the optimum conditions for cultivation are a heavy, neutral to alkaline soil and dappled shade. Plant in autumn and leave undisturbed as the fleshy roots run deep and plants may take several years to re-establish fully. They do not divide well, so propagate from seed (selecting only the best flowering forms) or buy a new plant in flower and add another beauty to your collection!